The great thing about spending so much time getting to know Jesus is that you start to recognise his voice and his ways because you are familiar with them. Jesus describes this relationship in the parable of the Shepherd and his flock. As the Shepherd, he knows that when you know and trust him, you will recognise his voice and follow him. Over the noise and busyness of all the world has to offer his voice can be heard. In a crowded room where everyone is talking, I will instantly recognise and be able to locate my son or my husband because I am so familiar with their voices. It is not just their voice, but the tone and the manner in which they speak. I hear it all the time so to me it is unique in a room full of people. Have you ever recognised someone from a distance just because of they way they walk or hold themselves? It is familiarity that makes someone you are close to easily recognisable. This is why I continue to encourage you to spend time with Jesus. He wants you to become so familiar with his voice and his ways that you will not be easily deceived by the whisperings of the enemy or led away by the promise of instant pleasures. The enemy will try many ways to tempt you away from following Jesus but because you recognise Jesus' voice you know that these whispers are not from him. 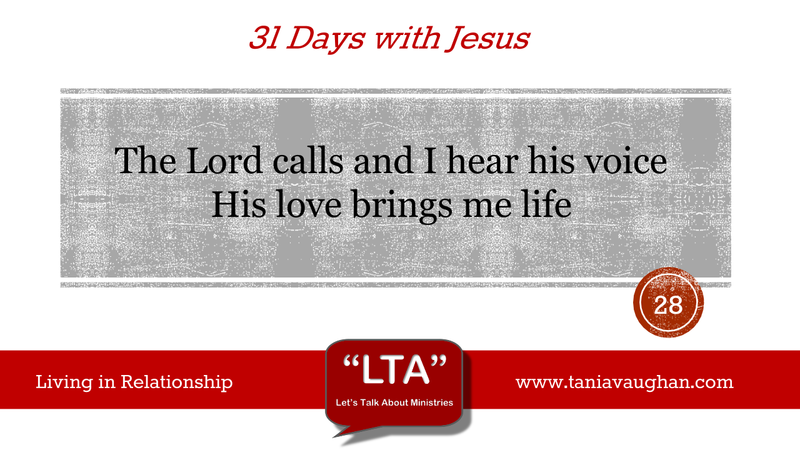 When you're not sure if what you are hearing is the voice of Jesus, look at the words and the action. You have not only been learning about hearing Jesus but about who he is and his ways. The Shepherd will lay down his life to protect his flock, he leads them to safety. The shepherd comes directly to the sheep, not in a round about way. If what you are hearing seems underhand, will put you in harms way or is not in the nature of Jesus then you can be sure it is not from him. Jesus will lead you into full life, the enemy looks to destroy you (10:10). The closer your relationship with Jesus the more you will discern his voice and leading above all others. The enemy can seem powerful but has already been driven out by the sacrifice of Jesus (12:31). There is no power just deceit and lies. Jesus has the power. Many non believers think that the power is to control, to get you to follow a set of rules and to put restraints on your life. It is the rules of religion that make many people sceptical of Christianity. Jesus' power is not to control, it is the power of love. Nowhere else do we see how much Jesus loves each person than in the story of Lazarus. He was deeply moved, troubled in spirit and he wept, for Lazarus, for his sisters Mary and Martha and for the people that mourned. Jesus' power is in relationship not religion. When you do not hear his voice, when he sees you being tempted by the lies of the enemy, Jesus is moved, troubled in Spirit and he weeps. As with Lazarus, Jesus uses his loving power to draw you back to life, you are like the lost sheep in Luke 15 that the Shepherd goes after until he finds it. Lord, I thank you that the relationship we have is two way. You want me to know and recognise you for my protection and to enable me to live a full life because you love me. Lord, forgive me when I do not hear your voice and am tempted away from you. I am thankful that you always bring me back, help me to go deeper in my relationship so that I always hear your voice. In my line of work noise can be a big deal! When noise is loud it can be literally deafening but you can manage that. When there is a variety of noise - shouting, radios, drills, diggers etc the resulting noise becomes so confusing, distracting and disorientating that guys cannot think or listen out for directions - including the fire alarm! There are lots of distractions in our lives - some of our own making others as a result of work, or home life. what we are reminded of here is that we need to listen for God's voice; if there is too much noise then we will never hear him. Remember that JC often took himself off to a quiet place to talk and listen to his Father - Mount of Olives, Garden of Gethsemane etc. it is worth noting that around these times Jesus would have been constantly harassed, questioned, accused and tested by the crowds of people he taught and healed. Don't forget over several chapters you can read that Jesus would have taught 9000 men - that's without counting the women and children, visited the temples and synagogues, been driving out seller and money changers by overturning tables, attended weddings etc, Zacchaeus even had to climb a tree just to get a look at Jesus. JC and the 12 would often take to a boat to get some peace and quiet. If you want to hear the Sheppard voice you have to find a place where it is still enough to hear. that may mean getting up earlier to get some quiet time. it may mean changing habits in preparation to meet with Christ -switching to praise music in the car or censoring what you feed your heart - TV, magazine and so on. What you can count on though, is that if you do find a quiet place you'll be amazed how well you can hear!